Johan Coorg from renowned speaker manufacturer KEF presents the new Reference 5 series and brings as well in his luggage, an incredible worth of background knowlegde. For those vinyl addicts out there, Armin Kern from HiFi-distributor Audio Trade will be waiting with different phono pick-up cartridges, ready to put them all to comparison via testing. Alongside will be Richard Drees from AudioQuest, also be the new edition of specialty cables released last year. Our team will of course be well represented; feel free to note products for you’re interested in so that you can be assisted in any way, shape or form. On top of that, enjoy the chance to pick up tips on better listening in one of our extensively decked-out headphones studio, which is available to you throughout the evening forlistening tests. Now we come prepared to the fields of TV and home cinema: because here we have something for you. In addition to the current Ultra-HD TVs in our range, the performance of the latest generation of Sony’s 4K projectors is an impressive highlight of the visual market right now. And as the soundtrack contributes such a significant portion to the overall atmosphere of a movie, this aspect should not be looked over simply. Just as the first Dolby Atmos-enabled Blu-ray discs were stocked by us, the AV-Reciever from Denon also became available. 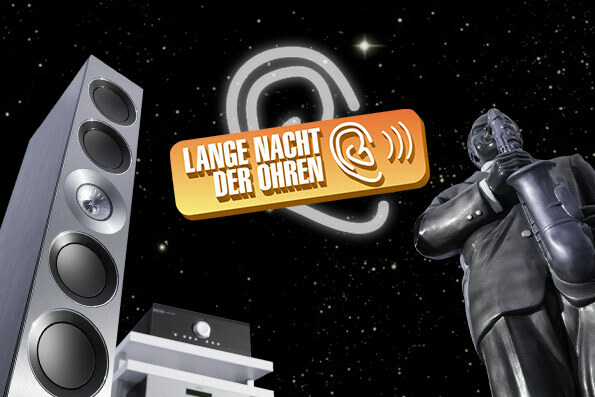 Now all that is needed are the ceiling-installed speakers and there we will have a demonstration of the new standards in surround sound from Dolby Atmos, just to keep in theme with the Lange Nacht der Ohren. In addition, our comparison of three high-end Soundbars shows another way how the thin sound can raise flat screen TVs to a whole new level. Bowers & Wilkins Panorama 2, Focal dimension and Monitor Audio ASB-2 compete against each other, but rest assured that all of the manufacturers have placed particular emphasis on fantastic sound in the design of all the models. All the more exciting is to see if we can find a clear favorite and which candidate in convinces you in terms of the precision in the spatial representation! That’s our program overview for this year. Finally, we want to cordially invite you to join us for what will be an interesting, sociable and sensuous (in every sense of the word) evening!